Godwin's law predicts that if an (online) conversation (regardless of topic) goes long enough, sooner or later someone will be compared to Hitler. This was photographed at the Women's March NYC the day after Donald Trump's inauguration. To my liberal friends, it's simply not useful putting a Hitler mustache on everyone you don't like; Grow up, take the high road, come up with solid arguments and action plans and then do something. 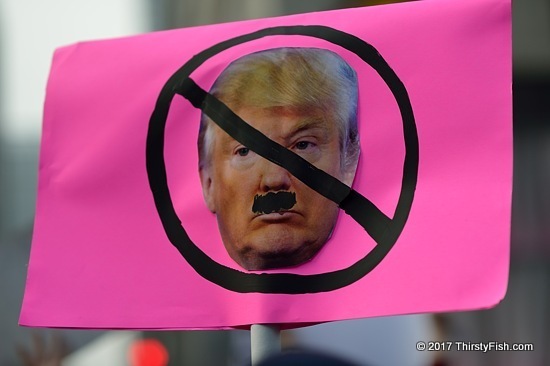 Trump is not Hitler; Trump is, well, Trump.